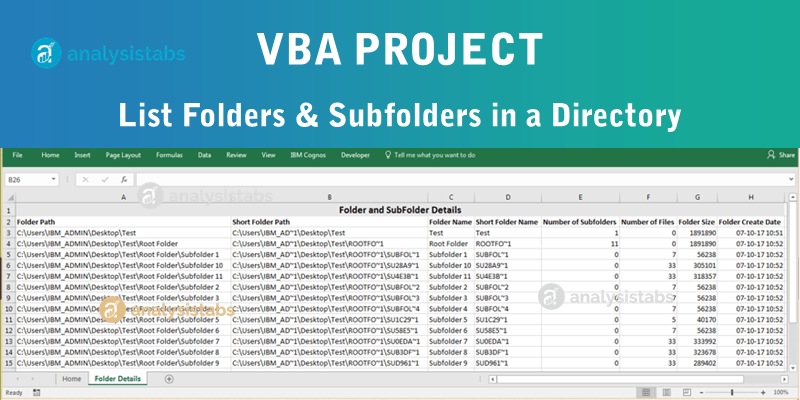 Objective: VBA List Folders Subfolders in a Directory helps you to list or find all folders and Subfolders from a Directory. You can list all details of Folders in a Worksheet. So that we can easily have an eye on all the details related to Folders and Subfolders. It includes Folder property details like complete path, short path, folder name, short folder name, file size, folder create date, number of Subfolders, number of files in a Subfolder etc. To List Folders Subfolders in Excel Workbook, minimum one worksheet should be exist (Note: Please keep it in mind workbook always contains minimum worksheet. We can’t delete all worksheets from a workbook). Let me explain the key steps to develop this folders and Subfolders details in a Worksheet project. We are going to write two procedures (sbListAllFolderDetails and sbListAllFolders) and one function (sbBrowesFolder) in one module. Please find step by step instructions to List Folders Subfolders from Directory. Step 1: TurnOff screen update and Events: We are temporarily avoiding screen flickering and events triggering in the application. Step 2: Variable Declaration: We will be declaring required variables and objects which are using in our procedures and function. Step 3: Browse Main folder (Directory): We will browse and select root folder list folders and sub folders from Directory. Step 4: Delete old ‘Folder Details’ Worksheet: Before creating new ‘Folder Details’ Worksheet, we have to check if there is any existing Worksheet with the same name and delete it. Step 5: Add new ‘Folder Details’ Worksheet: Lets add new worksheet, named it as ‘Folder Details’. Step 6: Create Title and Headers : Here we will create main title and headers and then will do formatting to Main title and headers. Step 7: Calling Sub Procedure from Main Procedure: Here we call Sub Procedure to list folders and sub folder details in Worksheet. Step 8: TurnOn screen update and Events: Let’s reset the screen update and events of application. Here is the detailed VBA Code/Macro/Procedure explanation. We are creating two procedures here. The first procedure name is ‘sbListAllFolderDetails’. Now we will discuss about first procedure. Step 1: Disable Screen Updating is used to stop screen flickering and Disable Events is used to avoid interrupted dialog boxes or popups. Step 2: Declaring variables which are using in the entire project. This VBA code prompts the user to browse for a folder. You can select folder to list files and Subfolder from Directory. Now click on Ok button to continue process. If you click on cancel button, It will display message like “Please select folder to find list of folders and Subfolders” and exit from the Procedure. sRootFolderName = sbBrowesFolder & "\"
MsgBox "Please select folder to find list of folders and Subfolders", vbInformation, "Input Required!" Here is the function to browse Directory folder. .Title = "Browse Root Folder Path"
Step 4: Deleting the ‘Folder Details’ Worksheet if it exists in the Workbook. And Display Alerts is used to stop pop-ups while deleting Worksheet. Check if any worksheet is exit with name ‘Folder Details’. If it exists, delete sheet using delete method. Step 5: Adding a new WorkSheet at the end of the Worksheet. Naming as ‘Folder Details’. And finally it is assigned it to an object (shtFldDetails). Here we are creating Main Title as ‘Folder and Subfolder details’. Creating header titles and applying format to it. So that it looks neat and clean. .Value = "Folder and SubFolder Details"
.Range("B2") = "Short Folder Path"
.Range("D2") = "Short Folder Name"
.Range("E2") = "Number of Subfolders"
.Range("F2") = "Number of Files"
.Range("H2") = "Folder Create Date"
The below called sub procedure lists all the details of folders & sub folders. It then uses recursive procedure to loop through all folders and subfolders and the list its properties of folder and it captures all those details to a new Excel sheet called “Folder Details”. The second sub procedure name is ‘sbListAllFolders’. Now we will discuss about this second sub procedure which is used in main module. Step 8: Enabling or TurnOn Screen Update and Events at the end of the project. Please find the following procedures and Function to List Folders Subfolders project. Here are steps to create above specified project in the workbook. Place any shape by clicking on insert menu from illustrations group. Right click on the shape, select assign macro. select the macro name(‘sbListAllFolderDetails’) from the available list and click on OK button. Now, go to the Developer tab. Design Mode should be turned off from the Controls group. Now, go back to the shape and click on the created shape to see the TOC Worksheet in the Workbook. Copy the above procedure and paste it in the newly created module. You can hit F5 key from the keyboard and you can see the ‘Folder Details’ Worksheet at the end of all Worksheets in the workbook. Here is the project workbook macro file to explore yourself. Please find below link to read more details about files and folders. Thanks for explaining the concepts to deal with Folders and Subfolders using VBA. It is very helpful. This is a great help to the beginners like me. Thanks for publishing the code. How can I also get a list of files in each folder/subfolder?